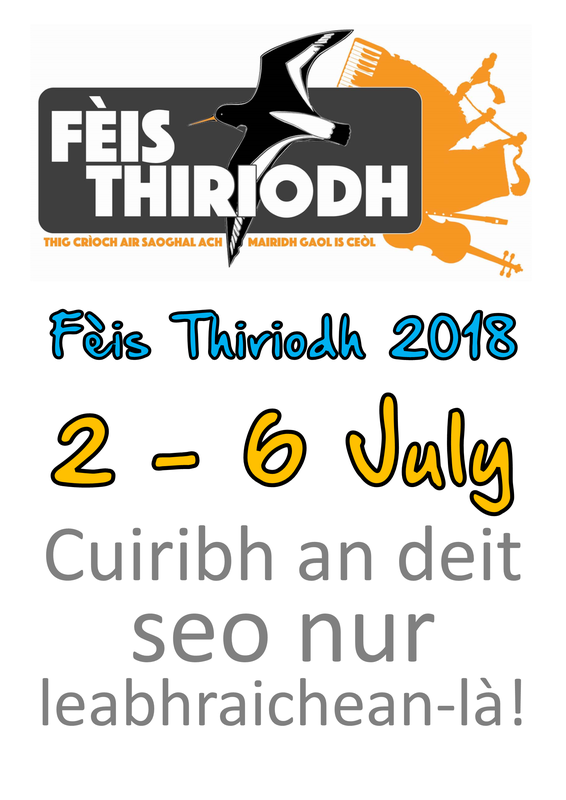 Feis thiriodh 2018 booking forms are here! Only a few weeks to go until our Feis Thiriodh, and it’s time to book your space and choose your classes!! Please find below three links to the booking forms, for the main Feis, Feis bheag and Feis bheag bheag. You can download these, fill them in and either post them to us, email them, or hand them in at Tiree school. All details are on the forms themselves. You can also check our facebook event page for any updates! As the last notes of the final strip-the-willow echoed out over the Crossapol shore, exhausted Fèis Thiriodh committee members looked back over a packed and successful festival that celebrates the island’s music and culture. 2015 was the 25th year of the Fèis and the anniversary was celebrated in some style. The week started with a lovely joint service at Heylipol Church, where singers Linda MacLeod from Uist and Iona Brown were aided by some little people on paper musical instruments. Monday saw the 25th Anniversary Concert and 220 people packed the hall to hear some of the island’s most famous musical stars. Angus MacPhail from Skipinnish, Daniel and Martin Gillespie of Skerryvore and Campbell Brown from Gunna Sound had taken the time to come over and support the Fèis. They were joined by this year’s tutors and other past tutors, including Arthur Cormack from Fèisean nan Gàidheal and Donald Black, who waved one hand with great enthusiasm to arouse the audience while playing the mouth organ with the other. Founder member Flora MacPhail, whose newly written theme song for the Fèis became an instant hit, was particularly thanked, along with Joyce MacInnes and John Holliday for their tireless work promoting music on the island. The next evening Ian Smith presented the results of his year’s research into the island’s past prolific whisky production, before unveiling a plan to look into setting up a micro-distillery on Tiree in the future. The children’s dance was sold out with 200 jigging and reeling to Eilidh MacFadyen’s band. The first ‘game’ took so long because of the number of competitors that it became the last game too! The ‘Muse Cruise’ to Barra attracted 108 music lovers. The six-hour session and sing-along was only interrupted by a strip-the-willow on Castlebay pier, complete with a number of canoeists still in their wetsuits and lifejackets! The dancers and pipers of Fèis Bharraigh gave the ferry a send-off to remember with a Highland dance perilously close to the pier edge followed by a blast from the ship’s horn and a lone Tiree piper on the ship’s aft deck. Trail West rounded off the week with a dance described by Ian Smith as “brilliant”. Numbers at the classes were up again with 61 at the main Fèis, 33 at Fèis Bheag and 40 at Fèis Bheag Bheag for the under-5s. This was back to the levels last seen during the golden days of the Fèis in the 1990s. The Tiree Fèis has had its low points over the past 25 years. When the Hall closed its doors for a year the Fèis also closed and a party of children went up to the Uist Fèis instead. When the school closed for maintenance for several years classes were held in An Talla and in nearby caravans. Numbers attending went down so much that some committee members felt the Fèis had had its day. Tutors this year were Andrew Findlater (drums), Alain Campbell (guitar), Ian Smith & Gordon Connell (accordion), Scott Wood (pipes), Jamie MacDonald (fiddle), Linda MacLeod (singing), Doc Holliday (flute and whistle), Eleanor Sinclair (dancing), Iain MacKinnon (Gaelic conversation), John Angus MacKinnon (film making), Artair Donald (drama), with Iona Brown, Tara Rankin and Eilidh MacFadyen (Fèis Bheag).